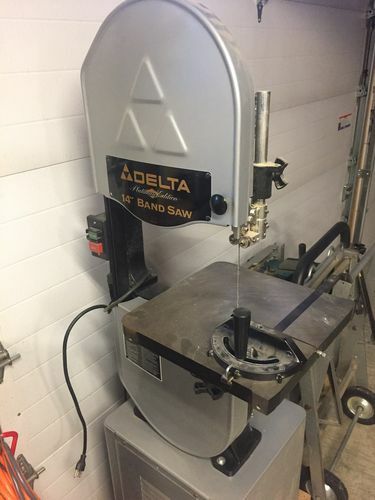 I recently purchased a Delta 14” Bandsaw Model 28-262 in nearly brand new condition (pictured below). I plan to add a fence system to it for all the usual reasons. After looking at the various fence options I am leaning toward purchasing the the Grizzly Tools model #H7587. It seems to be a beefy setup. Is there anyone on this forum that has a Delta 14” saw and uses this fence system who can share their findings regarding this combination for resewing and general woodworking. Thank you for any responses and input viewers care to share. The Platinum edition saw (1999) came with a fence… did you ask the seller if they still had it? I didn’t know these add-on fences existed, I’ve been wondering what to do for my bandsaw for years, cool! Does it clamp on both ends of the table when you lock it? Let me know how it goes if you get one please! I put the Kreg fence on mine alonog with the single point fence accessory and it worked really well. If you can find one at a decent price the original Delta fence was nice for general sawing and resawing of pieces that are not too thick. I like mine. That said for thicker resawing I made a wooden one. Thank you folks for the replies received so far they have been much appreciated. Brad, I am the third owner of the saw. I am sad to say I believe the fence disappeared in the exchange between owner #1 and owner #2. Bummer. I am considering building a fence and it sounds like your happy with yours. Would you be willing to post an image or two of your band saw’s fence to this posting? Fred, Kreg Tools are generally well made and I have considered their fence system. I like their price better than Grizzly’s. Have you noticed anything with the Kreg fence that you do not like? Pete, I agree with you and I have been looking for the Delta fence (model #28-855) that was intended for this saw but they are far and few between. The old Delta fences are often fetching $200 or more which is out of my budget because I am also planning to install a 6” riser kit also. A good magnetic fence will make you happy. A bandsaw isn’t a table saw and the fence doesn’t have to be such a precise piece. It just needs to stay put. Save yourself some money and aggravation. Fence systems for bandsaws are hyped and overly priced. I started out with one quick release magnetic base for my shop made fence and later found another mag base one at a restore so I changed it to a two magnetic bases and I really like it. It was quick to make, works great, stays put and was about $5 all total. Brad, I am the third owner of the saw. I am sad to say I believe the fence disappeared in the exchange between owner #1 and owner #2. Bummer. I am considering building a fence and it sounds like your happy with yours. 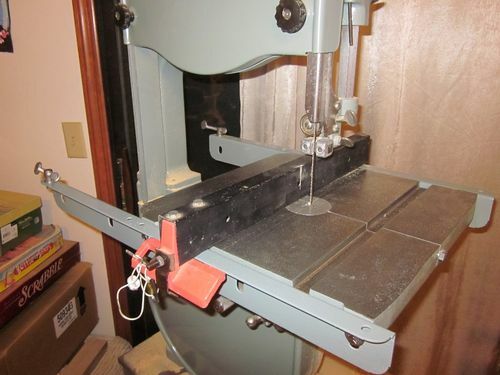 Would you be willing to post an image or two of your band saw s fence to this posting? Thank you to everyone who shared their time by responding. I am a little surprised there were no response from someone with a Grizzly fence on a Delta Band Saw. I guess it could be how the post is labeled in the description foeld. Looks like I am back to the drawing board on which way to go. Since I am mired down at work in a project leaving me no spare time I guess there is no hurry for another few weeks. Grizzly is ok. I had to grind the screw heads down so the stock didn’t drag. Don’t know if it’s holes or the bandsaws holes were off. It’s ok.
Brad, I like your fence pretty or not it looks efficient and able to get the job done. Thanks you posting it. If I need it taller, I have a thing I made out of laminated plywood (kitchen cabinet material that I scrounged from a construction site dumpster) that fits over it for additional height. Not fancy, but it works great. I made a fence for my 12” craftsman, for my 14” Jet I bought and installed a Kreg fence. They both work well. I have used nothing more than a board and clamp also. 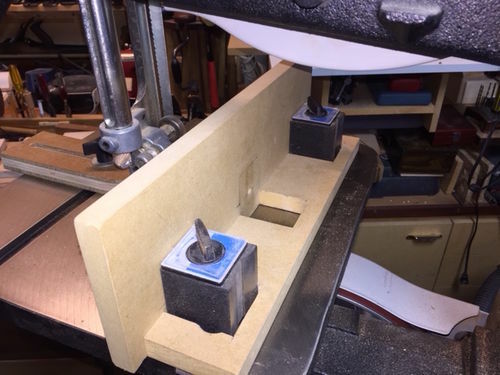 Just about anything will work for a fence on a band saw. The main criteria it needs to be vertical and stay in once place when clamped. There are a bunch of examples of DIY bandsaw fences on YouTube.